A Facebook post shared by tens of thousands of people claims to show “the youngest parents in the world” -- children aged 12 and 13 with a six-month-old baby. This is false: the children seen in the photograph are siblings. The photo was taken from the Instagram account of their cousin, a fashion designer who made the clothes they are wearing in the photo. We've pixellated the children's faces to protect their privacy. Some people expressed skepticism in comments on the post, questioning its veracity. Others described them as “cute”. The photograph has been watermarked with the handle @jaiyaingram, which leads to a private Instagram account that we could not access. However, a reverse image search quickly traced the picture to a Nigerian lifestyle website, AsoEbiBella (archive link here), where it appeared with a different watermark linking the picture to the handle @subwaytatted. 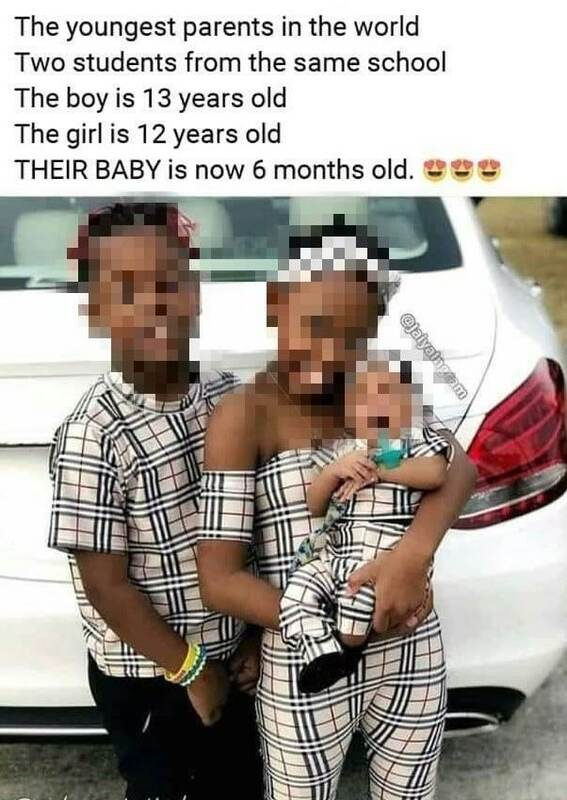 This led us the Instagram account Subway Tatted Clothings, where the photo of the three children was posted on December 30, 2018. The owner of the account, Florida-based designer Shameka Morris, says that it shows her cousins in clothes she made herself. n comments under the post, Instagram users have been drawing Shameka’s attention to the fact that the photograph of her cousins is being widely shared in a false post. “Somebody posted a status saying they was the youngest parents,” one user posted. “Their [they are] siblings,” Shameka replied, alongside an angry emoji. We’ve reached out to Shameka for further comment. The youngest confirmed birth mother in world history was Lina Medina, a Peruvian girl who gave birth at the age five years, seven months and 21 days in May 1939. Her father was reported to have been arrested on suspicion of having raped his daughter, but was later released without charge. Seventy years later, the father of Medina’s son is still unknown. The baby was delivered by caesarean section due to the extreme youth of the mother. It has also been reported that she had a medical condition which triggered precocious puberty, which left her able to bear children much earlier than normal.